Taking them out for a spin. I’m wearing a pair of Adidas Terrex Fast R Low hiking shoes in this photo. The main portion of REI’s Trail Running Gaiters are made of a lightweight, breathable, slightly water resistant and stretchy fabric that easily conforms to the upper shape of the shoes you use them with – much like any other trail running gaiter sold. What makes these particular gaiters stand out is that they are a low cut, lightweight gaiter that still includes a very durable instep strap (the technical name of the strap that goes under your shoe to help hold your gaiters in place and keep them from riding up your legs). My biggest complaint about light weight gaiters is that they almost always use some sort of paracord like string looped under your shoe to keep them in place. This is stupid. The whole point of lightweight gaiters is to be able to wear them in areas that have a lot of dirt, dust and small rocks that could get into your shoes. If you are hiking in those conditions you are most likely hiking over terrain that includes sharp rock and scree deposits. These conditions trash the stupid little bits of cord that are generally used as instep straps. Not only does the REI Trail Running Gaiter use a real instep strap – the thick rubber kind generally found on alpine gaiters and made from a super durable material called Hypalon – but it has an ingenious tightening method (similar to the cinch lace system made popular by Solomon’s trail running shoes) that isn’t nearly as annoying to use as the traditional buckle method to adjust instep strap length. While this beefy instep strap does add to the weight (they come in at 4.5 oz.) I think the durability trade off is worth it in this case. There are a few annoyances I’ve found with these gaiters. The first, and primary, is that they are not made to be put on 1/2 way through a hike. They are intended to be put on when you put your shoes on and worn the rest of the day. The reason I say this is because there is no front entry cut. Traditional gaiters are made to be put on after your shoes, facilitated by a seam running the length of the gaiters. The REI Trail Running gaiters don’t have this. The ankle opening is also not large enough (or stretchy enough) to be pulled on over a pair of shoes. This isn’t a huge deal to me since I plan on wearing these gaiters pretty much all the time when hiking in dry, dusty, and/or sandy conditions but I’m sure there will be times when taking them on and off bugs me. The other issue I have with them is that the top closure meant to keep debris from sneaking in through the top is a pure elastic closure with no adjustment possible. Again, this isn’t an issue for me because they are not so tight on me that they cause discomfort and not too lose that they let grit in but if my legs were thicker or skinnier than average this might be a problem. 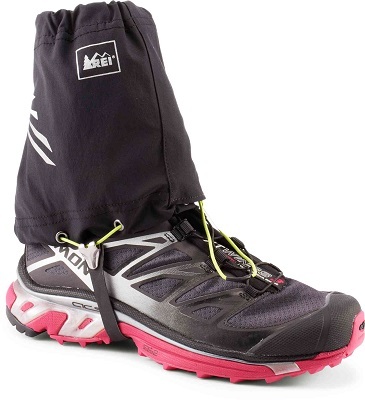 Finally, the one thing I consider is that gaiters are essentially disposable pieces of gear. I’ve gone through more pairs of gaiters than any other piece of gear. Things like crampons, sharp sticks, and a host of other things conspire to shred them. This is after all one of the reasons you wear gaiters – so they get trashed and you don’t. Therefore I rarely spend more than $50 on gaiters. The REI Trail Running Gaiters cost a wallet friendly $32.50. 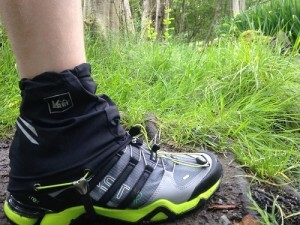 The REI Trail Running Gaiters are the best light gaiter I’ve found. This entry was posted in Activities, Activities, Backpacking, Gear, Gaiters, Activities, Hiking, Product Review, Brands, REI.